The fabric is machine-washable and "easy snap-off." Air Protect technology protects both the head and torso. Weight capacity of 70 lbs in forward facing mode. Headrest and harness adjust easily without rethreading. Cup holder keeps bottles and beverages securely within reach. This is my 3rd car seat. We have a Clek Fllo, Graco Extend2Fit and now this seat. This one is my sons favorite. It seems very comfortable and plush. We chose this car seat for our 8 month baby, it is beyond confortable for her, super easy to install and it has a 10 years life!!! Great purchase for the price. We switched to this car seat when my baby was 6 month old and he loved it. ProsEasy to install Washable material, still looks brand new after 1 year of use My baby seems vary comfortable in it. Love the way it looks in person. Installation was easy. Seems to be very comfortable. So far no complaints. This is a great car seat. 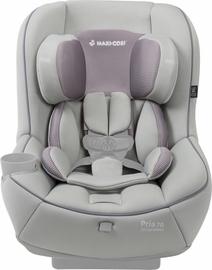 Although we had previously purchased the Uppa Baby Car Seat with detachable top for use in multiple cars, we decided to buy the Maxi Cosi so we didn't have to continually transfer the Uppa Baby top to multiple bases. 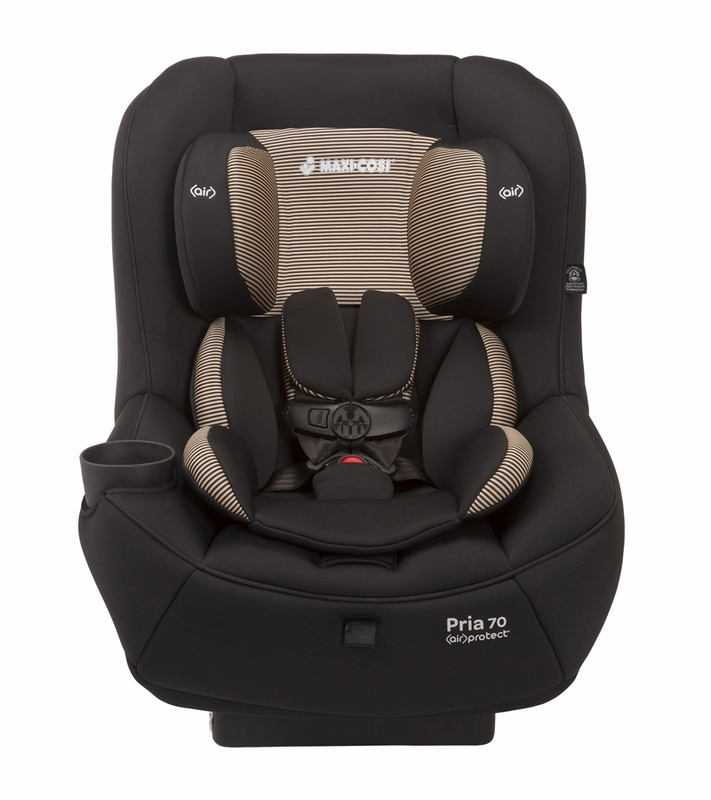 The Maxi Cosi is an extremely sturdy car seat; there are few car seats that have its bulk and durability. Although the buckle can be a bit cumbersome at times, it has gotten better over time, and we feel confident that our child is safe in this seat. This is not the car seat to buy if you are looking for portability, but if you are looking for a sturdy car seat that can accommodate infant to toddler at a reasonable price point, this is a great option. Great fabric and easy to install! 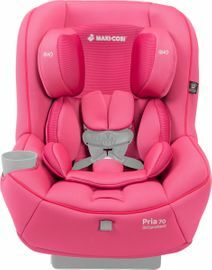 This is the 4th Maxi Cosi Pria 70 we have purchased for our girls. ( 2 girls under 4 and 2 cars!) Compared to other seats we have used we feel as those these are the easiest to install while still feeling substantial and safe. Love the look and how easy they are to clean. Also love that they fit well in our SUV, when others we tried did not. We have had this car seat for 3 years for our toddler and absolutely love it! It was a no brainer when baby # 2 outgrew her infant car seat. Easy to clean, good ventilation, easy to install, feels securely in place, and looks nice. Love how safe this feels and the reviews consistently seem good. After 3 years of a lot of use the seat looks brand new after a quick wash! 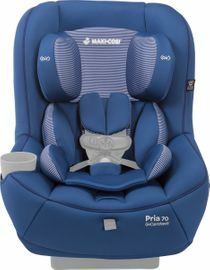 We really like our Maxi Cosi Pria 70 and Albee Baby's amazing deal on it. The seat itself is very comfortable for my rear-facing daughter. She will be 2 next week and weighs 24 lbs. The only issue I have with it is that the shoulder straps are hard to tighten, you have to really use force to pull them tight. This makes loosening them to get her out of the seat and then having to retighten them every time a pain. Other than that, we really like the seat. I�€™m in love with my daughters new carseat. she loves it and she falls asleep each time we travel somewhere. The quality is amazing and easy to wash. Shipping was QUICK! Car seat was on sale at a great price. Arrived quicker than expected. Seat is a beautiful color and was really easy to install. I love this seat! I got it for a grandma's car seat since she babysits for us but I'm really wishing that I had gotten this seat for my car. It reclines so its super comfortable and the color is very attractive. Delivery was very quick too. I'll definitely shop here again. Thanks guys! All car seats are difficult to install, IMO, and this one is no exception. But my daughter is so comfy in this seat she falls asleep after being on the road for only a couple minutes. In her previous seat she would scream until we took her out. I am so happy I found this seat, and it really is a beautiful pattern. It is easy to install and the color is beautiful. My daughter likes to sit. The price is cheap compare to the nuna rava car seat. If the seat strap can be much longer is better! So safe and easy to use and the colors in person are even more beautiful than the pictures. Definitely heavier than I thought it was going to be. Not easy to lug from one car to the next if you are planning on using it on more than one car. But so so worth it. Bought this for grandma #2's car. It's easily adjusted, easily installed, and seems comfortable. My daughter seems to like it well enough. We really like this car seat. It�€™s super stylish and well constructed. I trust that baby is safe! We got this when our 1 year old started to get a bit uncomfortable for his infant seat. This has been so perfect thus far. He is now almost 20 months old and he fits so comfortably in this seat, still rear facing. The material is such great quality, keeps him cool and easy to clean. He has plenty of space and never complains about being uncomfortable. The seat has grown really well with him so far. We have also transferred this seat to several different cars with the transition being extremely easy as well as fitting nicely in each car. (prius, crv, hyuandai, etc) Get it! 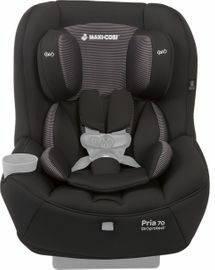 I didn�€™t want to spend that much on an extra car seat so I decided to go with Maxi Cosi pria 70. Everything about this car seat is great except for how hard it is to unbuckle my daughter sometimes. This is a great car seat. It's easy to install. It's easy to clean (the cover is removable and washable). The padding makes for a comfy ride. Adjusting for height is easy. The only downside is that this is a very wide car seat and cannot get multiple car seats across. This is the second maxi cosi car seat in our family. Both children are riding in them. They are comfortable for the kids. Safe for my piece of mind! And fit nicely into our SUV! Super spacious and comfortable for my little one! I love the car seat and special the color. Second times buyer and I still approve! This is the second MC Pria 70 carseat we have purchased from here and I'm still impressed!Everyone, I mean, almost everyone complains about the buckle difficulty, but let's be real here, anytime you strap a flailing 20+lb baby in and out of a 5pt harness, it's no walk in the park. But....this new one which was purchased two years after my first purchase, the buckles seem to be easier. So maybe MC brand listened to all the whiners and fixed the tough buckles, or I just got a lucky one. Conshmm..none, take that back, I wish the pink ones weren't so darn expensive. Best UsesPlaying in the mud, swimming in the pool or ocean, can be used as a hiking backpack, cradle if tilted, space seat, etc...if you think any of these are serious, maybe you should just rethink the whole parenting thing. We love this seat. We bought for my husbands car. Typically we use the Peg Perego convertible and actually love the Maxi Cosi better. My LO is 2.5 yrs old 32" 30lbs and fits so comfortably. The material does not make her sweat. The straps are slightly difficult to adjust, which works great too because you don't consistently have to tighten them from loosening. Def recommend this seat. 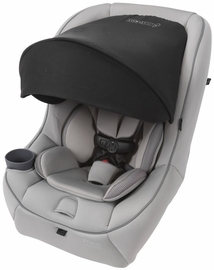 I'm new to Albee Baby and the Maxi Cosi brand, but found both when shopping online for babyseats in a lighter color. I love both this site and this brand and am now purchasing the Maxi Cosi 85 for my daughter's car, since my granddaughter is quickly growing out of the Infant seat we got her. My daughter loves this car seat. Easy to install and has great safety ratings. We have been using it since janury and have no issues. Its a big and confortable car seat. My daughter loves it. I bought this to put in my nanny's car. I have a Clek Fllo in my car and definitely prefer the Clek over this. The release button for the straps is so difficult to press. I have to use both hands to get it to release. I also feel like it's too padded on the sides. It is too narrow for my son, who is not a wide or chubby boy at all. It's also pretty wide. I was awestruck when I saw this seat at my local babies r us going out of business sale, but didn't have $280 to spend on it. I couldn't stop thinking about it and looking at the picture I took, so decided to look it up online on day and couldn't grab my wallet fast enough when I saw Albee baby. This seat is just gorgeous and the baby looks so comfortable. We are ordering a second for my husbands car! I'm still getting used to the buckles, as they are a little hard to undo and you definitely have to pull hard to tighten the straps after buckling her in. I've actually owned the bohemian red for the past year or so, and I love it so much that I decided to buy the blue for our second child. I highly recommend! Maxi Cosi doesn't disappoint. Love this seat! Its comfortable and safe for my kids. I love thats its adjustable and will suit them for a while. Its great rear facing or forward facing. We have 4 car seats of this style. 2 in my vehicle and 2 in my parents. 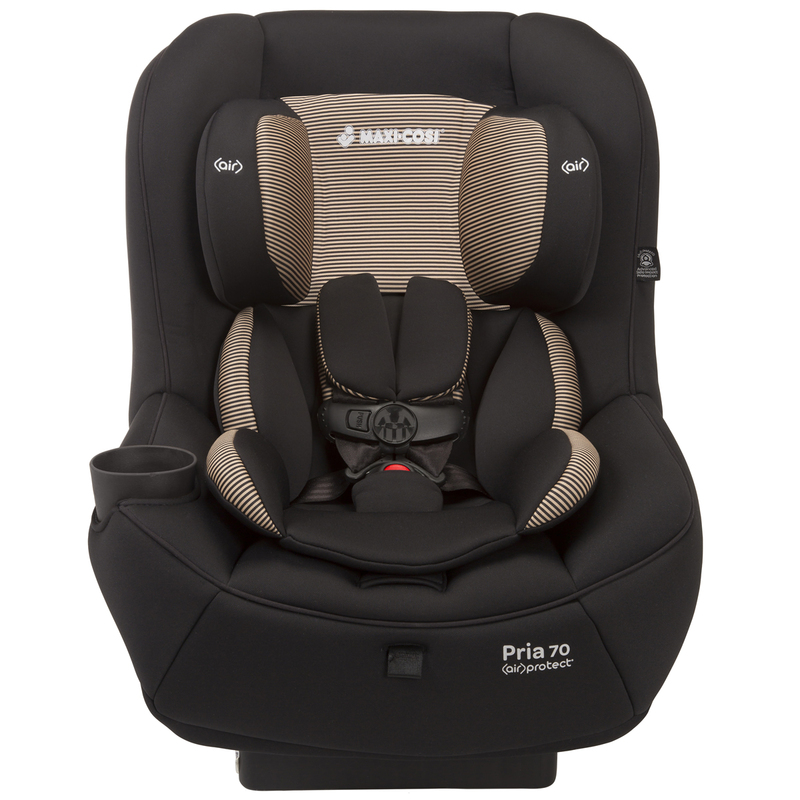 I love maxi cosi and have purchased 6 car seats of theirs so far. This seat is comfortable for my kids and safe!